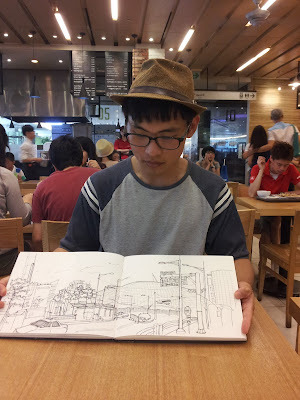 I'm new comer so hyoung. 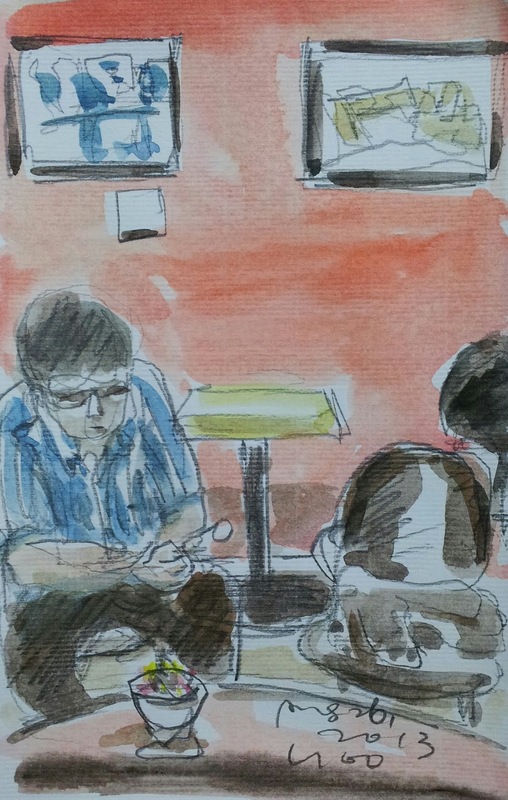 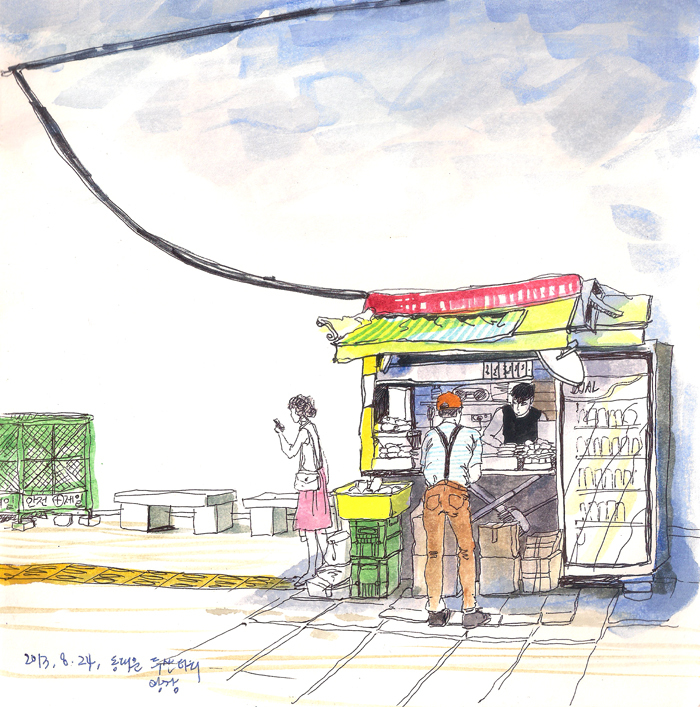 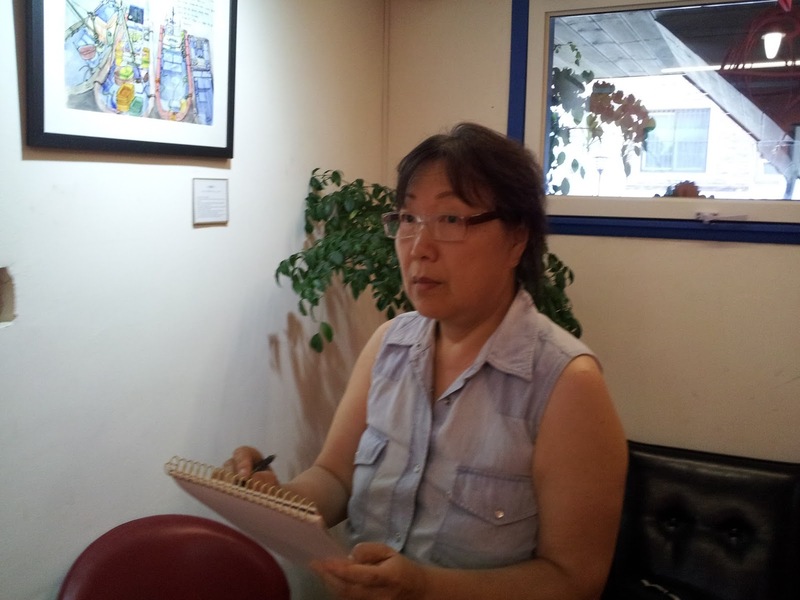 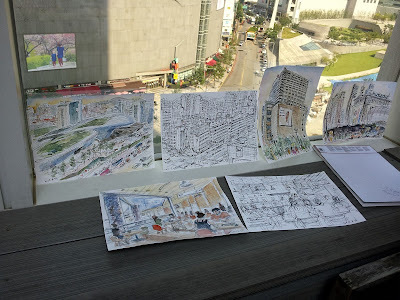 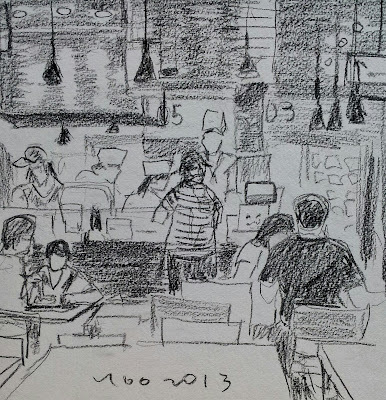 Last Saturday, I joined Seoul sketchcrawl around Dongdaemun Design Plaza. 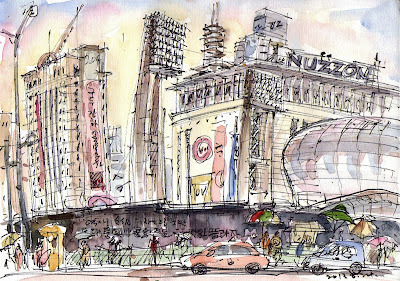 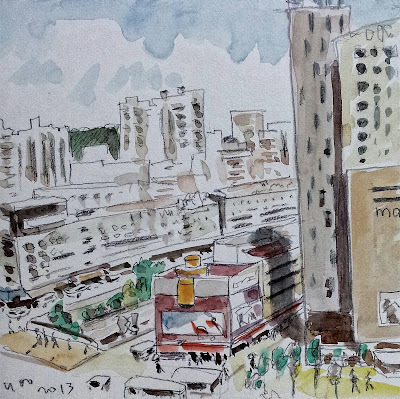 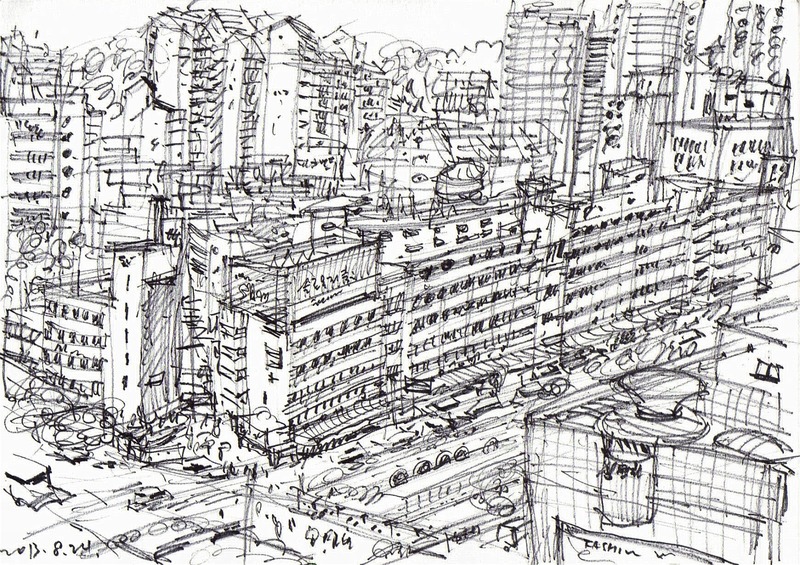 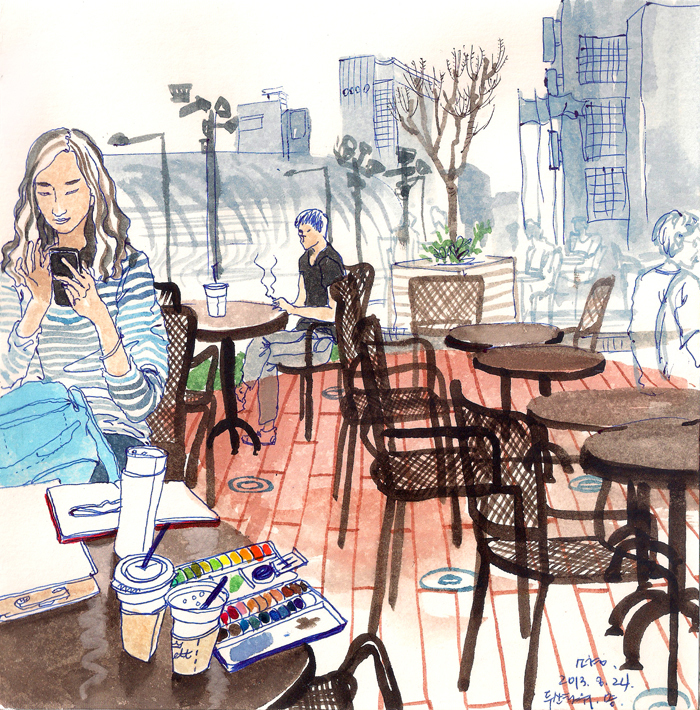 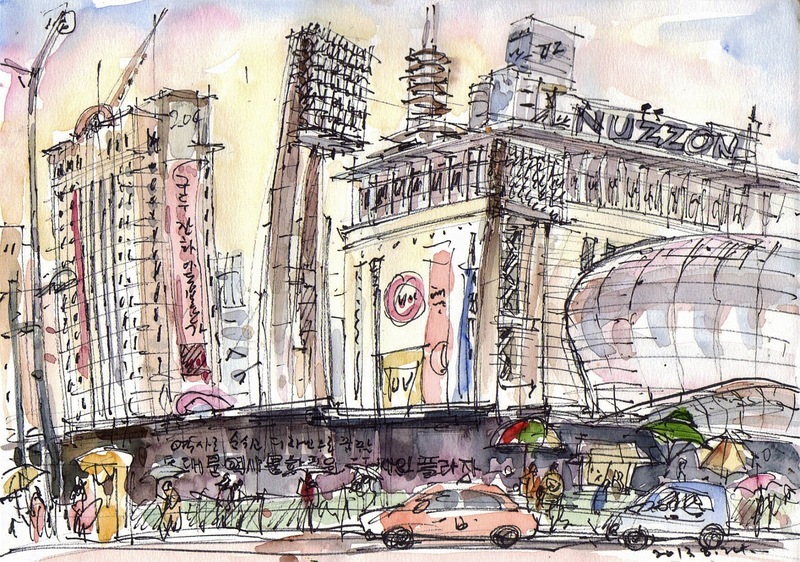 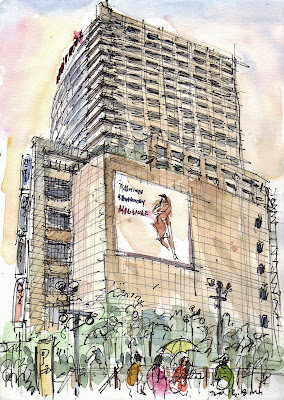 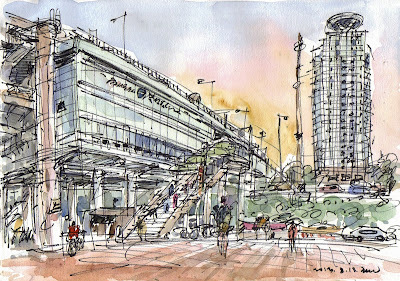 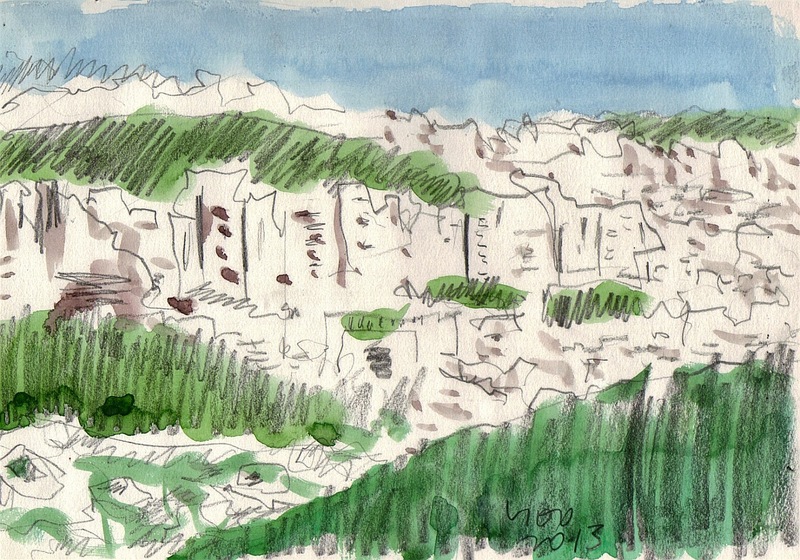 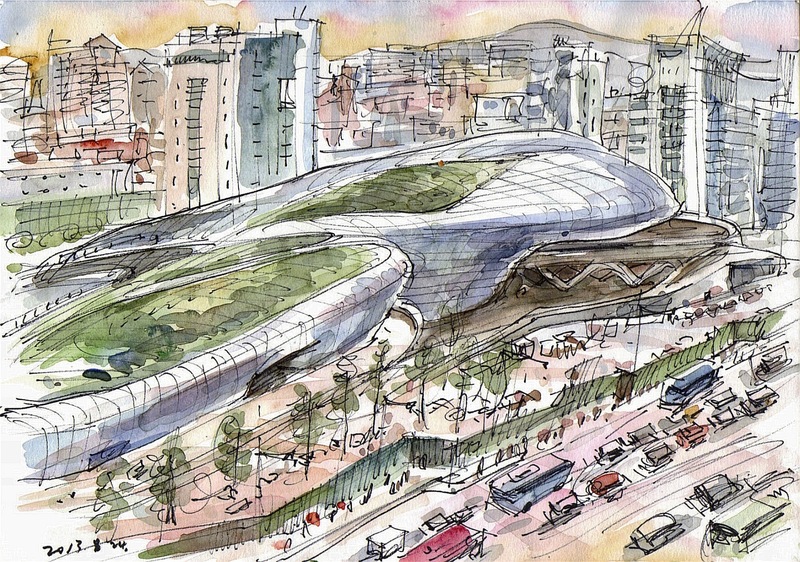 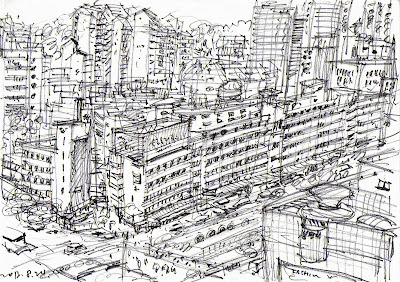 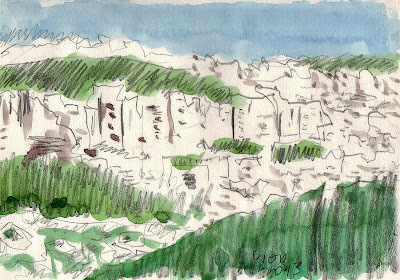 Dongdaemun and its surroundings are always attractive and interesting for our urban sketchers. This is because those have the colorful sceneries including the history of metropolitan Seoul. 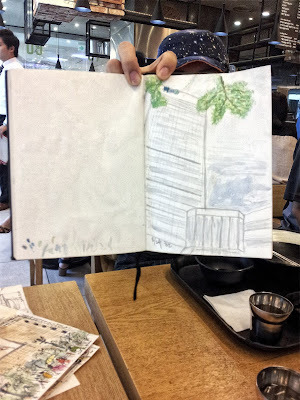 We enjoyed sketching in and outside the Doota Building situated in the center of shopping center buildings. 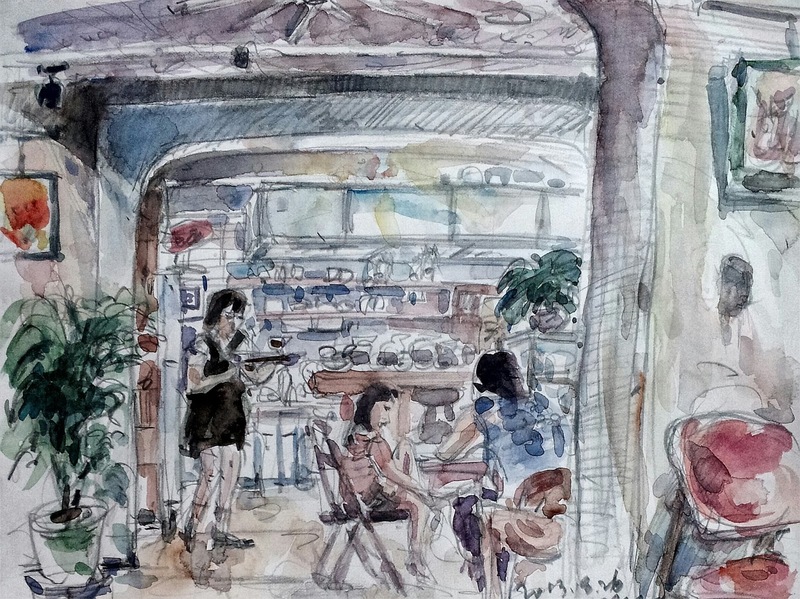 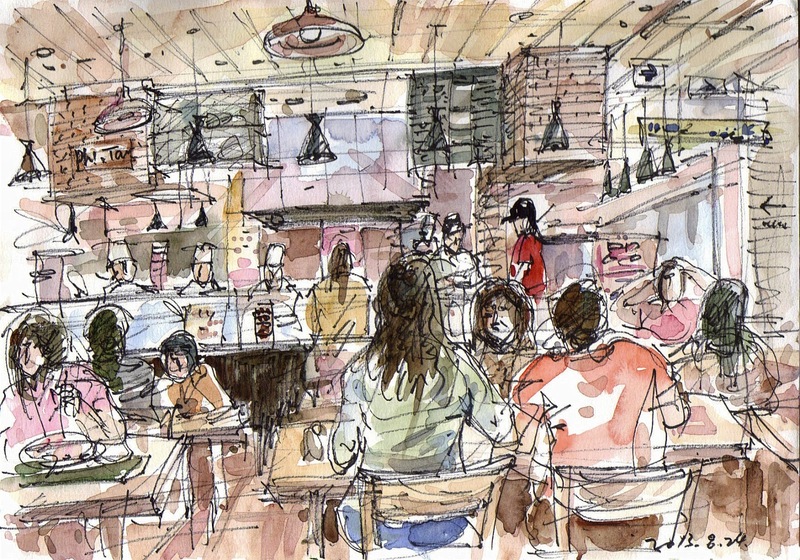 Welcome the new comers and congratulations on Seoul sketchcrawl! 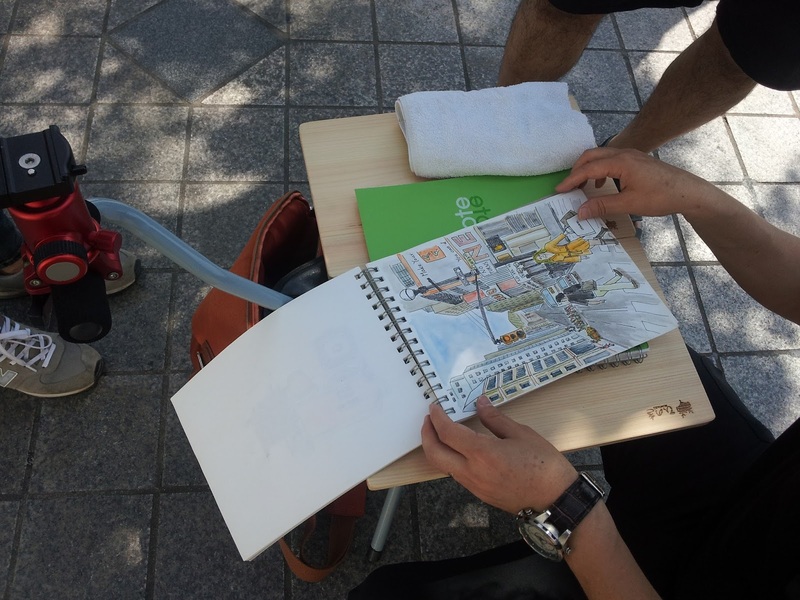 동대문 주변은 역사문화적 환경을 지니면서도 역동적이고 활발한 스케치 장소입니다. 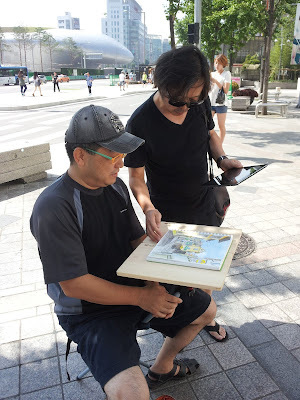 익숙한 소재들이지만 보면 볼수록 새롭게 다가오는 느낌들이 매력적입니다. 문화재와 도떼기시장, 하이 패션이 어우러지며~ 시시각각 변하는 생생한 삶의 현장입니다. 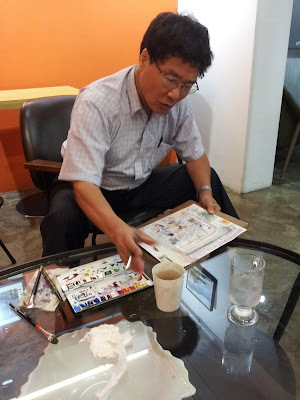 Yesterday I and YH Lee visited the Cafe Gallery One to see the works of Lee Sang-jin. 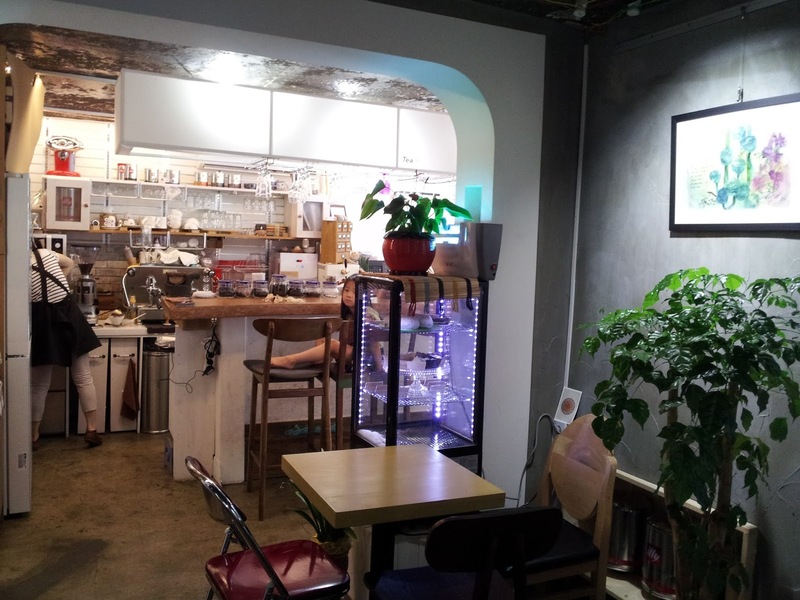 The cafe was a remodeled house. 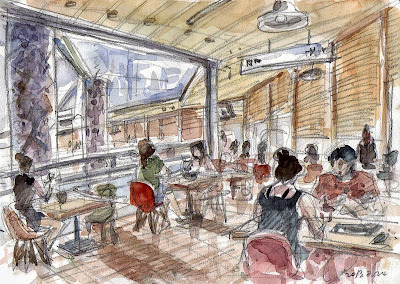 The former rooms were designed newly with pastel tone colors keeping the old structure. 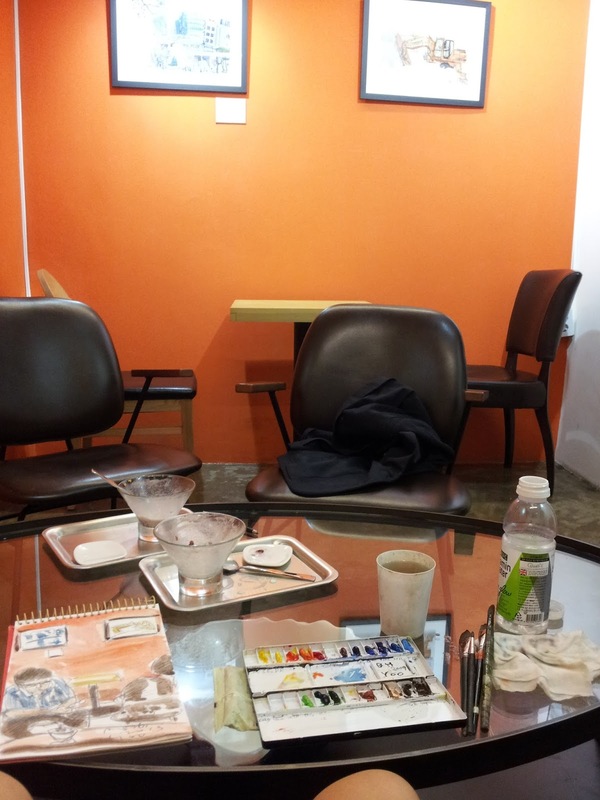 We had red-bean sherbet(Patbingsoo) appreciating his nice works. 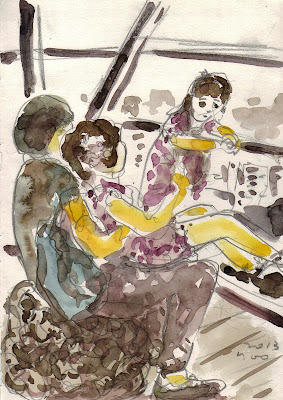 In the cool room we sketched too. Hope your 1st exhibition to be successful, SJ Lee! 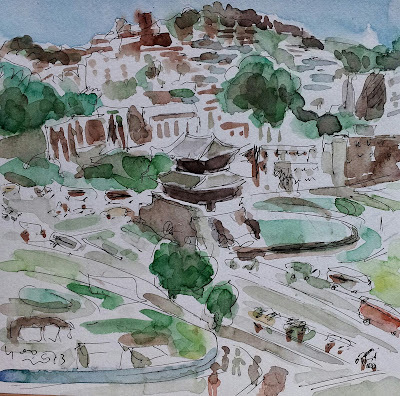 어제 이용환선생님과 이상진선생님 전시회에 다녀왔어요. 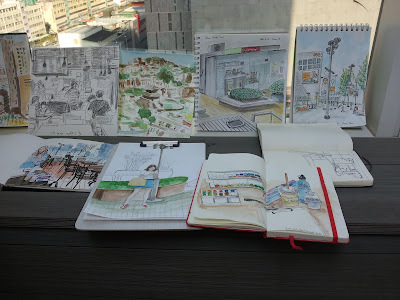 망원동에 위치한 예쁜 집에 크고 작은 그림들 잘 감상했습니다. 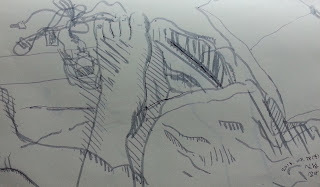 시원한 룸에서 스케치도 하구요. 첫번 전시회가 성공적으로 잘 마쳐지기를 바랍니다! New comers, Lee Mun-su and Lee Jeong-gweon, were talking about sketches on a marvelous and creative tool for sketching outdoor, which was assembled by Mr Lee Mun-su. Lee yong-hwan and new comer Seo Joo-young were talking in the plaza of Doota building. 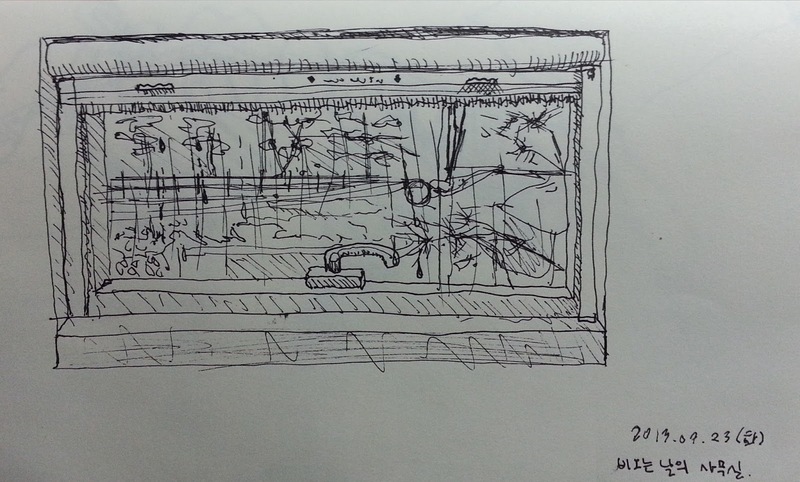 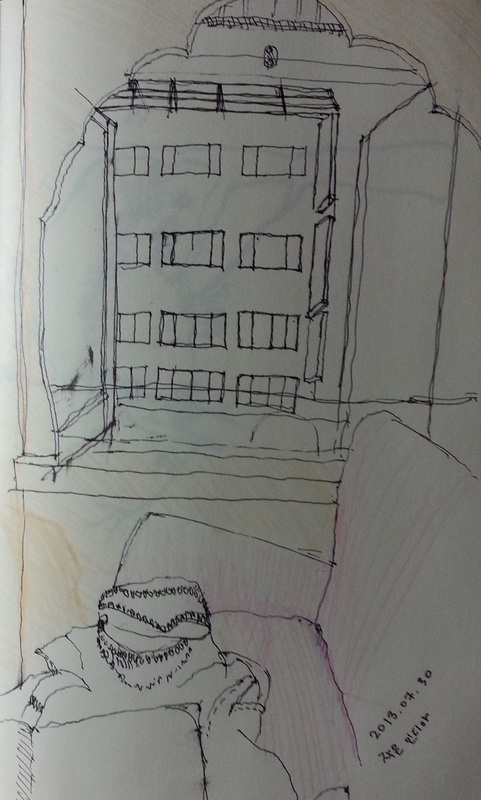 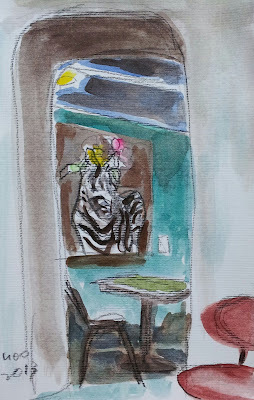 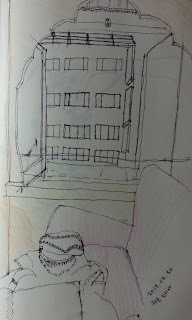 I usually sketch in woman rest room on 6th floor because it's very clean inside with great view through big pane glass. 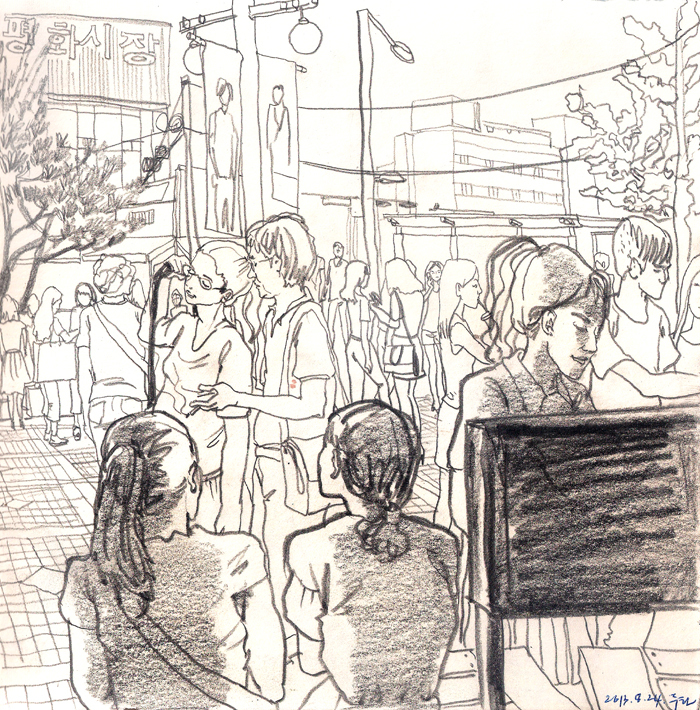 I didn't expect many sketchers would come because the weather was still very hot. 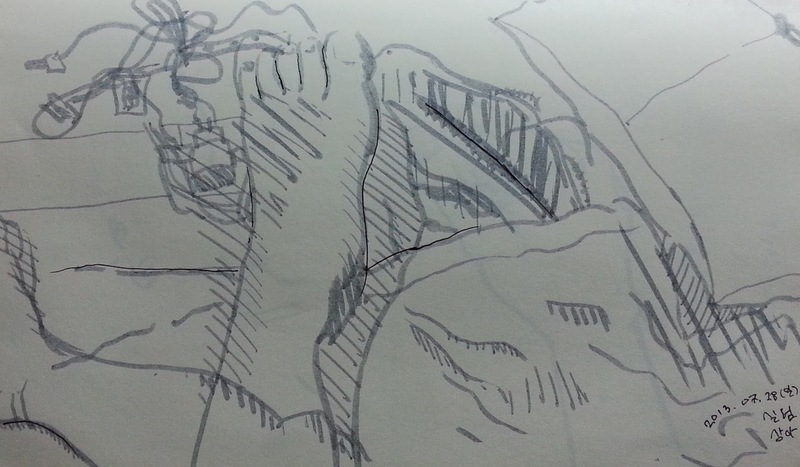 Wow, I was wrong. 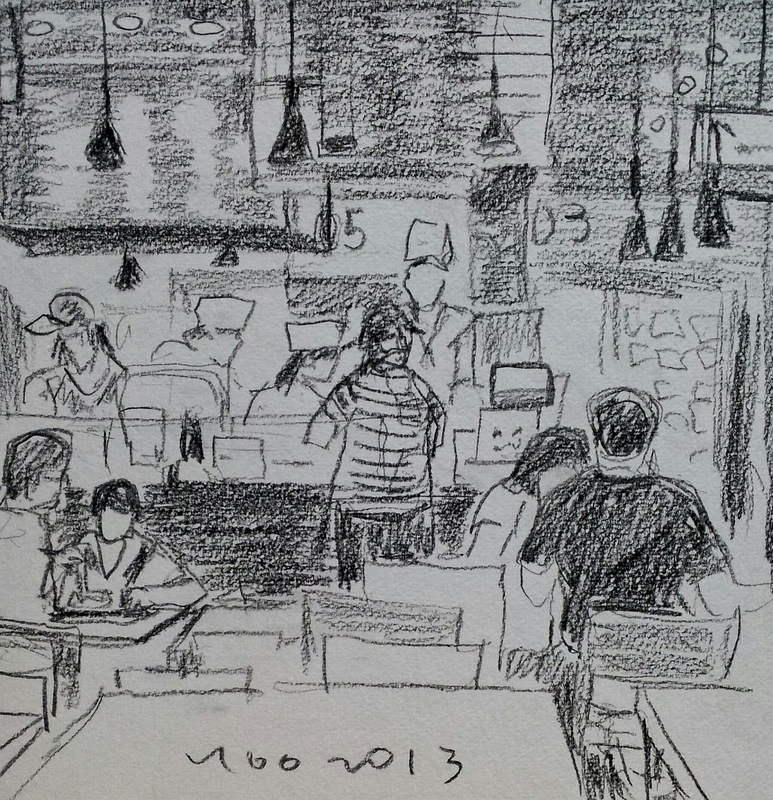 One by one, new comers appeared. 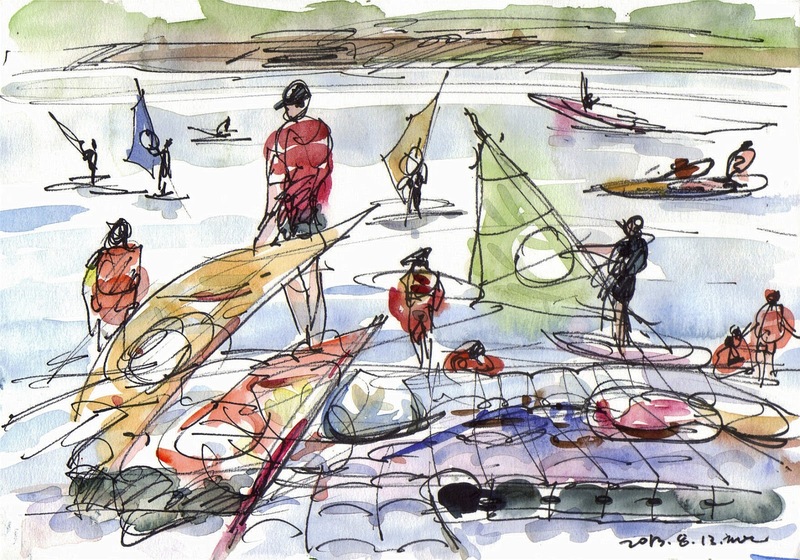 Their aspiration and curiosity for sketching was far bigger than any excuse. Five new comers, Lee Mun-su, Lee Jeong-gweon, Woo Jeong-hwan, Seo Joo-young, and Kim So-hyung joined us, Lee yong-hwan, Lee Sang-jin, Lee Si-weon, bh yoo. 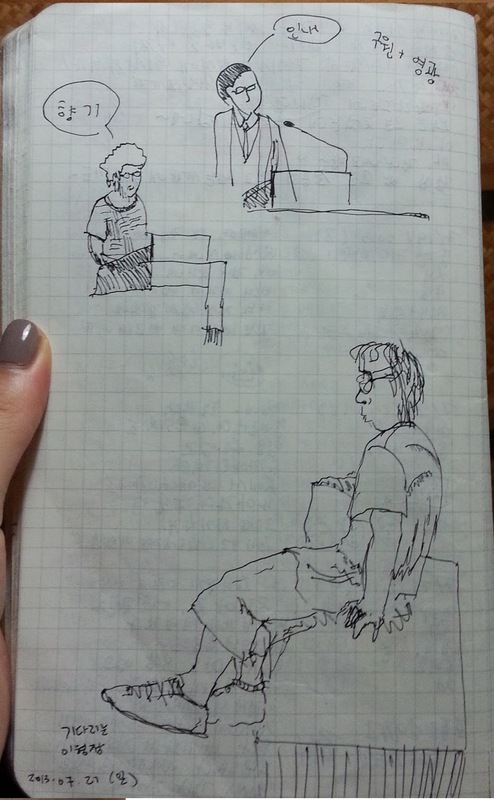 Thank you all, and see you soon! 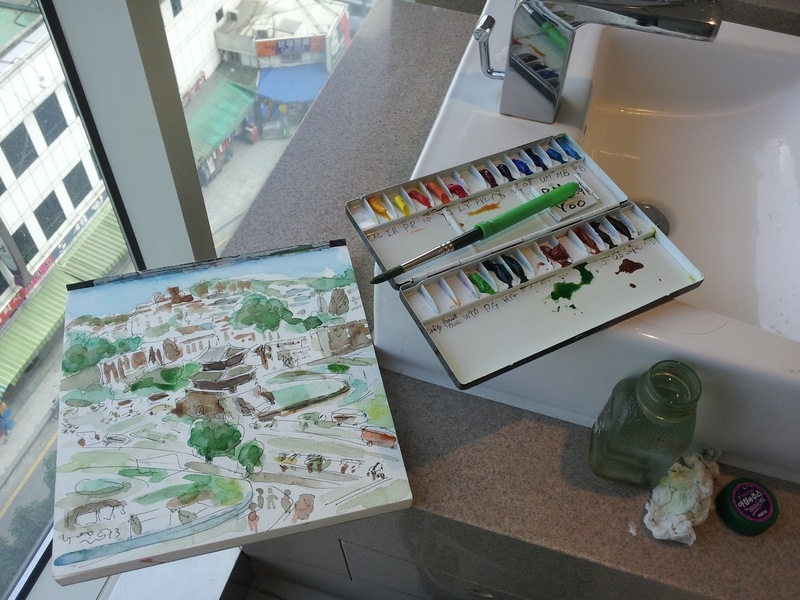 어제 여전히 무더운 날씨임에도 불구하고 새로이 다섯분, 이문수, 이정권, 우정환, 서주영, 김소형님들께서 참석하셨습니다. 지금 Cafe Gallery One 에서 스케치 개인전중인 이 상진님도 참석해주시고, 지난번 조계사 스케치에 참석하셨던 이 시원님도 합류하셔서 즐거운 모임을 가졌습니다. 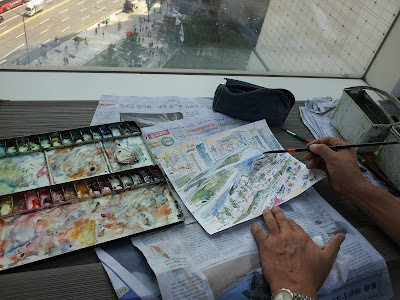 새로 오신 분들도 서로 연락처를 주고 받으시는 모습이 좋았어요. 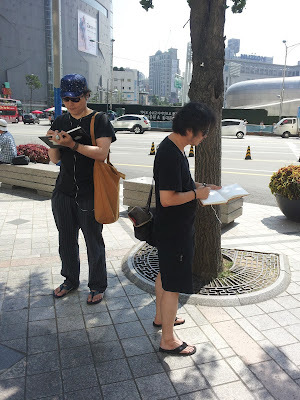 앞으로도 많은 만남과 교류의 장이 되었으면 합니다. 남은 여름 건강히 지내시고 그림 많이 올려주시기를 바랍니다. 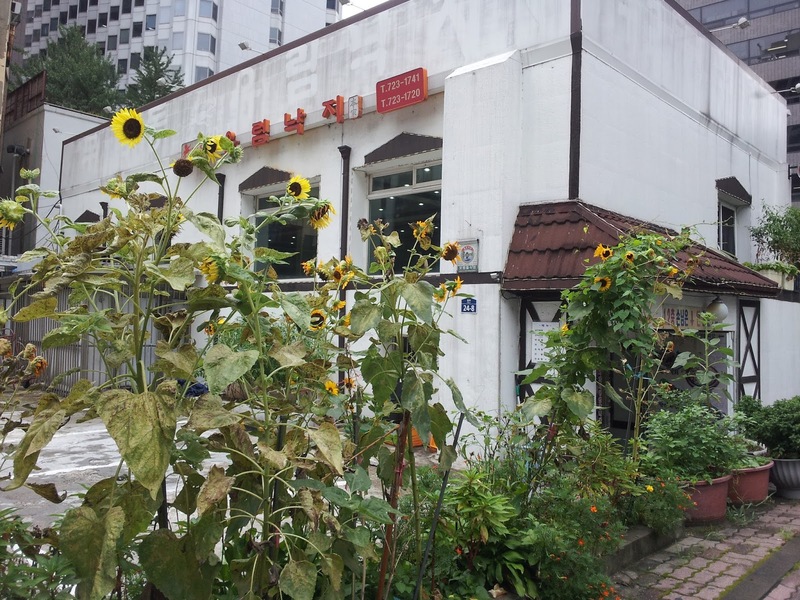 Walking along the street at Mugyo-dong near Gwanghwamun I found a small bed of sunflower near the Yurim Nagzi (small octapus) restaurant which has a long history of 40 years. 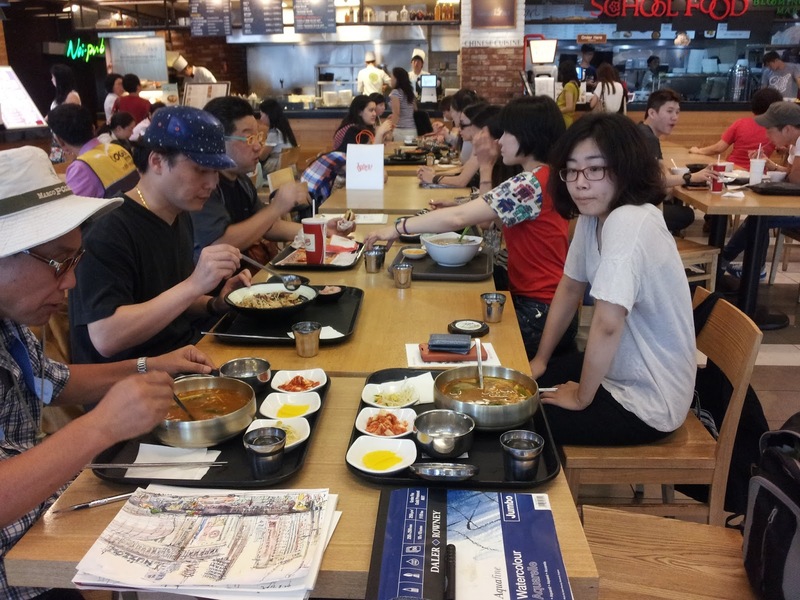 It's famous for the very hot taste. Seeing the sunflowers in downtown gave fresh feelings. 무교동을 걷다가 유명한 낙지집 간판 아래에 작은 해바라기 화단을 발견하고 반가왔습니다. 음식점에 들어가 물을 얻어서 잠시 스케치했어요. 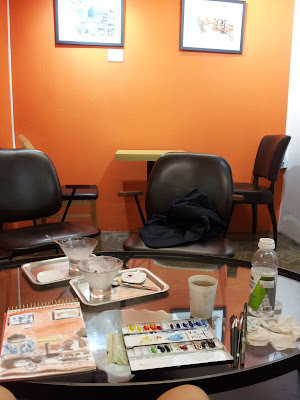 안써 버릇하던 회색 붓팬을 써봤습니다. 총무님 말씀따라 안올리니 계속 안올리게 되네요. 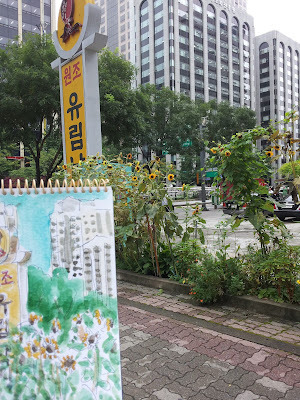 A few days ago, the weather was oppressively hot and humid, I went out sketching to Ttukseom Hangang Park to avoid the hot summer. 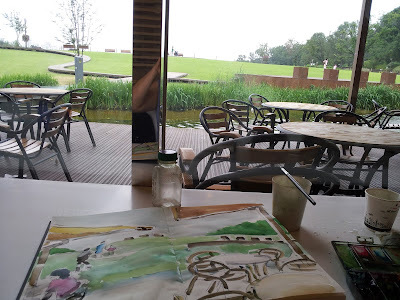 Ttukseom Hangang Park, located on the banks of the Han River in Seoul, is a very pleasant area to enjoy some leisure time in natural surroundings. 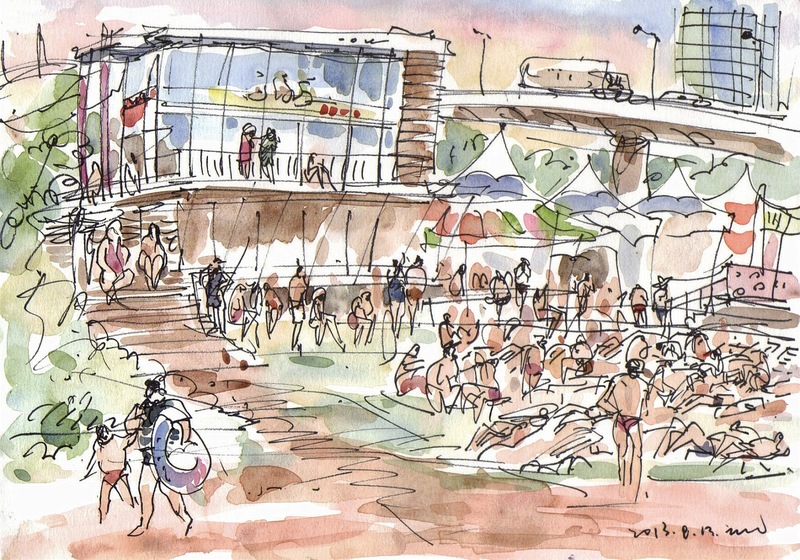 Hundreds of people unable to leave Seoul's asphalt jungle crowded swimming pool or the Han River's banks to try to escape the heat. 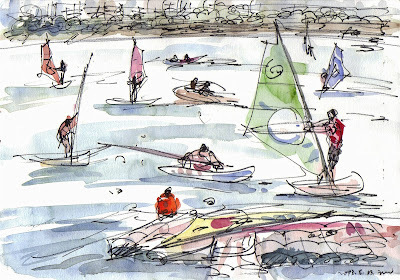 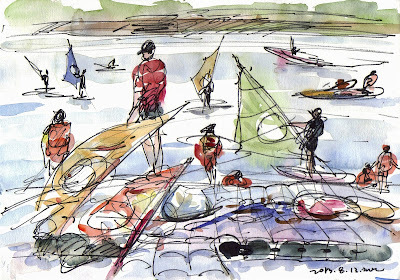 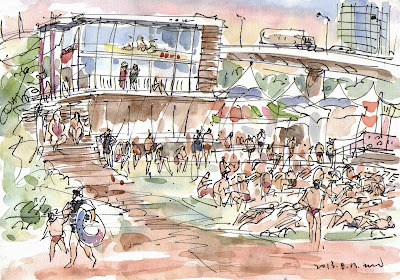 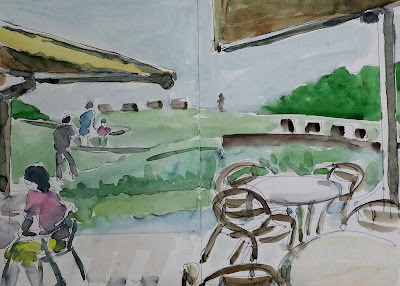 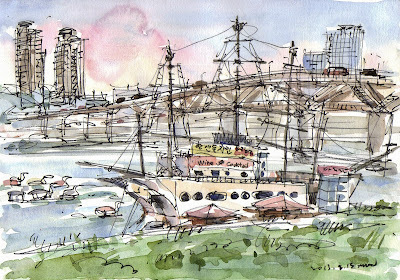 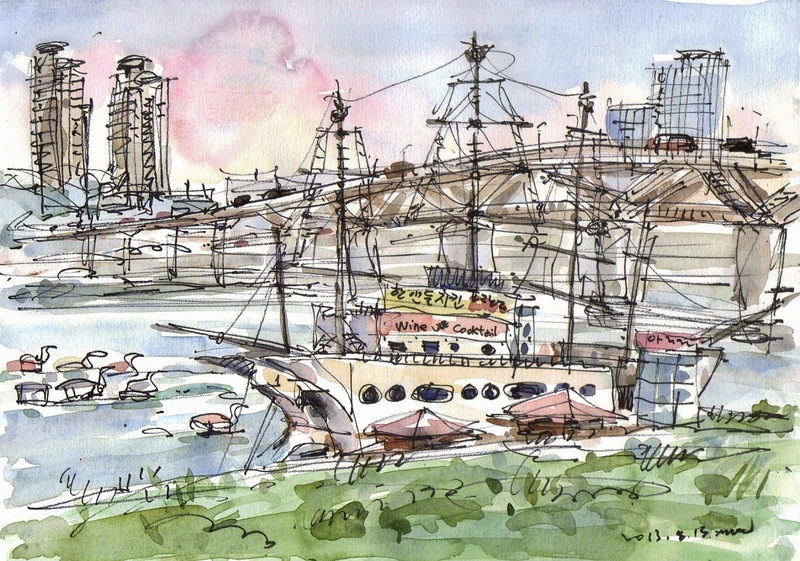 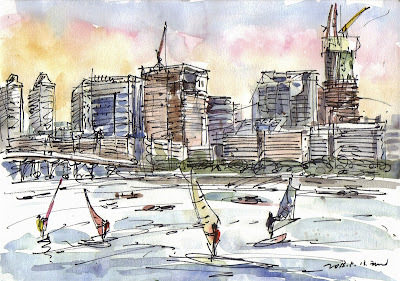 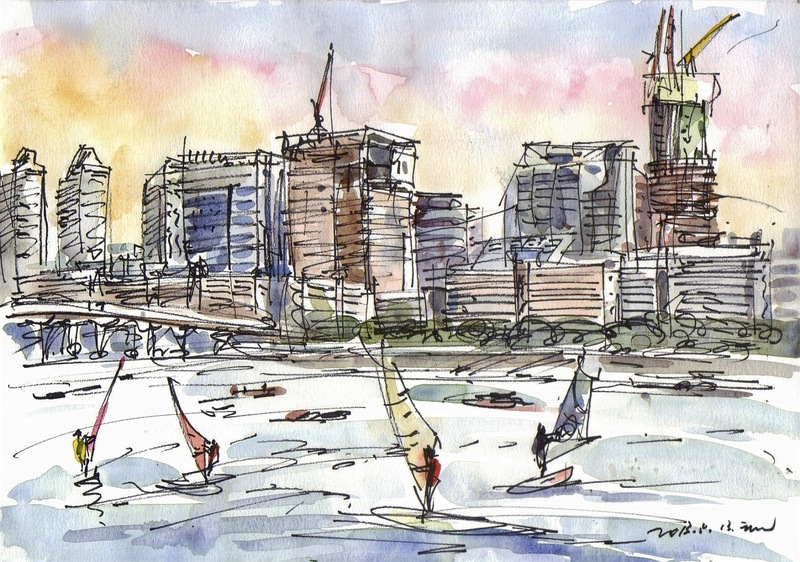 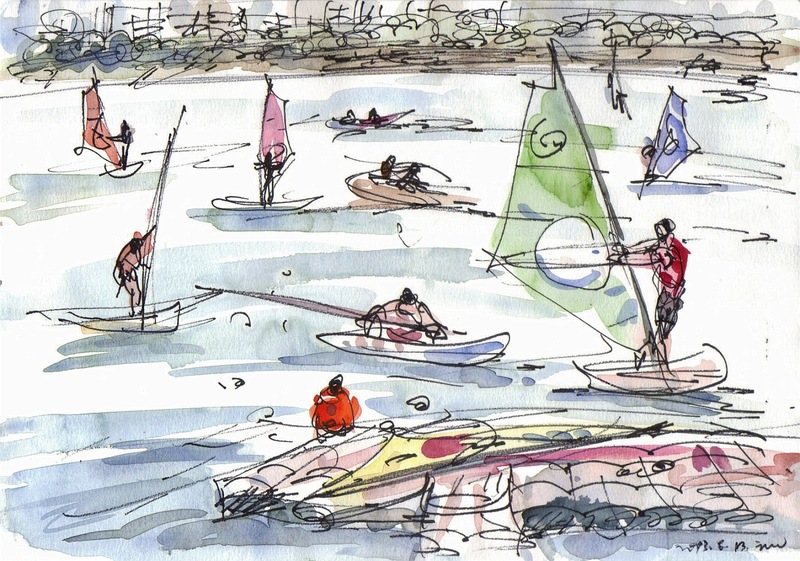 I sketched some lively sceneries from place to place around Ttukseom Resort near the Han River. 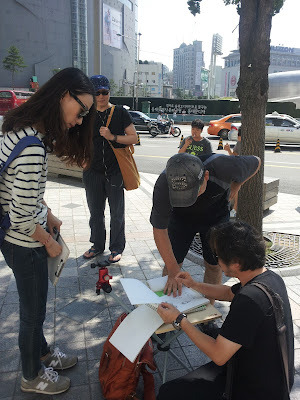 땡볕의 스케치는 극기훈련이지만 땀 흘린 후의 상쾌함은 뚝섬 유원지의 삼복더위를 날려 주는 듯 합니다. 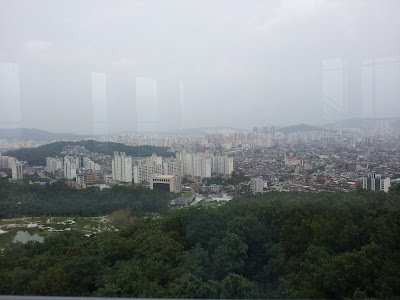 Last month I visited the Forest Park located at Weolgye-ro, Gangbuk-gu, Seoul. 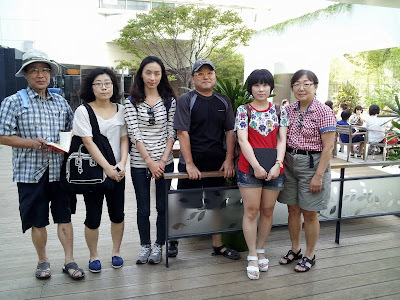 I went there with family long since when it was an amusement park as Dream Land(1987 -2007). 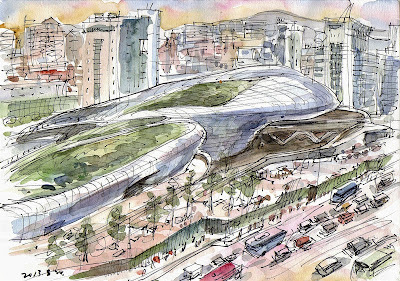 The new park opened on 2007. 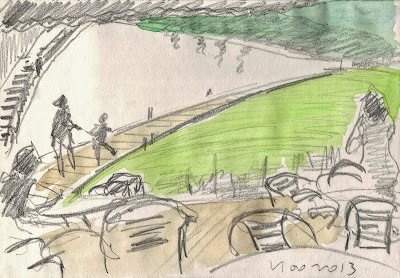 The park was good for people to walk and rest. 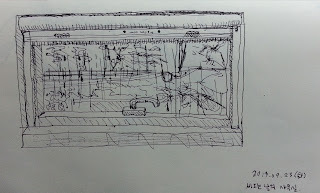 Kids were playing under the fountain water or in streamlet in park. Cafeteria, Chinese restaurant, gallery were located in too. The observatory tower was fantastic to see the cityscape. In Autumn the scenery will be beautiful with cool weather. 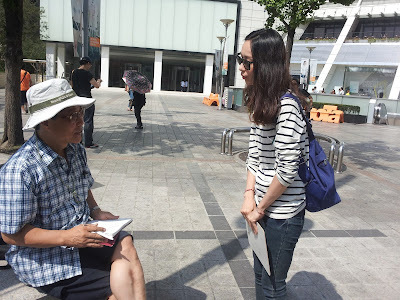 예전에 자주 갔던 드림 랜드가 북서울 꿈의 숲으로 바뀐 후 몇년만에 처음으로 가봤습니다. 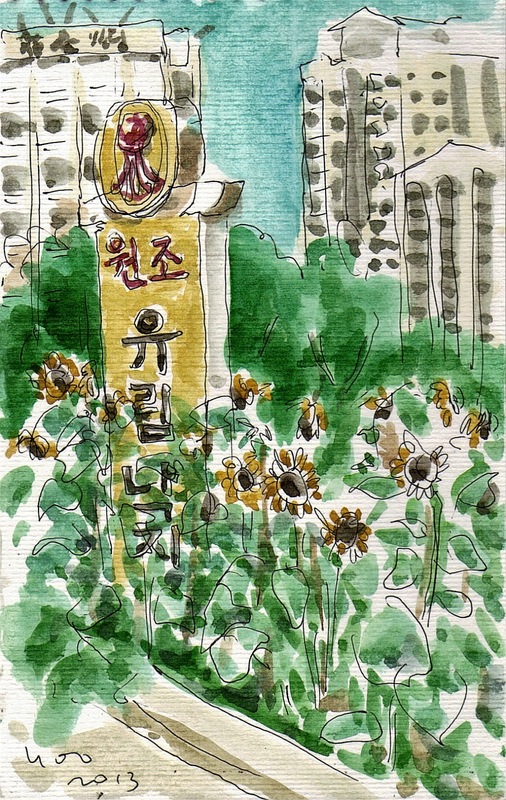 넓직한 공원으로 바뀌었더군요. 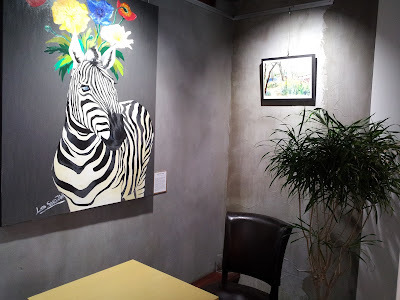 전에 눈 썰매장으로 쓰이던 곳에 전망대가 있었구요. 여러 단계로 올라가서 보니 참 시원했습니다. 후덥지근하고 비가 오락가락하는 날씨에 전망대 안은 시원해서 좋았어요. 가을이 오면 단풍든 모습이 아름답지 않을까 생각했습니다.